ASP.NET MVC 5 Hosting is the technology that brought me to Microsoft and the west-coast and it’s been fun getting to grips with it these last few weeks. Last week I needed to expose RSS feeds and checked out some examples online but was very disappointed. If you find yourself contemplating writing code to solve technical problems rather than the specific business domain you work in you owe it to your employer and fellow developers to see what exists before churning out code to solve it. The RSS examples I found had their own ‘feed’ and ‘items’ classes and implemented flaky XML rendering by themselves or as MVC view pages. If these people had spent a little time doing some research they would have discovered .NET’s built in SyndicatedFeed and SyndicatedItem class for content and two classes (Rss20FeedFormatter and Atom10FeedFormatter ) to handle XML generation with correct encoding, formatting and optional fields. All that is actually required is a small class to wire up these built-in classes to MVC. In a controller that supplies RSS feed simply project your data onto SyndicationItems and create a SyndicationFeed then return a FeedResult with the FeedFormatter of your choice. 3. Switching to Atom format involved just changing the new Rss20FeedFormatter to Atom10FeedFormatter. Today, I’d like to show you how you can use this awesome tool in ASP.NET MVC projects. First of all, unlike nuget bower runs on node, so if you haven’t installed it go and grab the installer from nodejs.org. After that, the installation is really easy—just type the following command. Great, we have installed bower and now we need to configure our dependencies in the ASP.NET MVC project. For this purpose go to the project root (not the solution, but MVC project root) and create a file called .bowerrc, and in this file we are going to specify the directory where to put components. You can place this file to your home folder and all your projects will use this configuration, but I prefer project specific settings. Next step is defining the dependencies with bower.json file. Put it in your project root folder as well. This is my configuration file for Bonobo Git Server. At the moment, I use two libraries—Pure CSS framework and Font Awesome. Change them to the ones you wish to use in your project. There is a useful package explorer is on the bower homepage. Excellent, we have configured the dependencies and are ready to install them. Open a command prompt or PowerShell and navigate to the root of your MVC project and run the following command. After that, all your dependencies will be installed under Content\components directory and there is one last thing you need to do to start use them in your project. 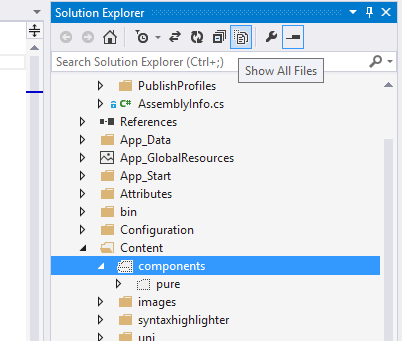 You have to include them in your project file and for this we are going to use solution explorer inside Visual Studio. Firstly, turn on the option Show All Files. 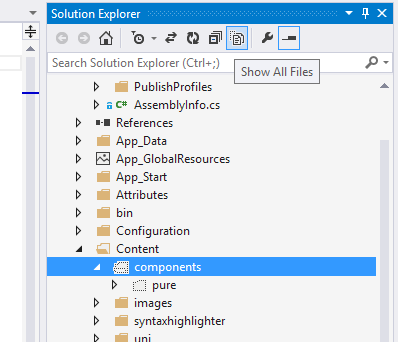 Secondly, locate the Content\components folder and include it into your project. This can be done by right-clicking on the folder or file and clicking on Include In Project. Personally, I include only the files I need, because lots of packages comes with chatty sources and other development stuff. For example, for Pure framework I include only the pure-min.css file. And that’s it. From now, you can use the libraries in your project. While this article may be very simple and straightforward, there are a few concepts here I think are important to note. In my next article will be looking more in depth on the idea of creating a customized Web.config, but for now with this article, I just want to look at activating the bundling and minification feature by using the xml tags inside a MVC's Web.config. This feature is only available in ASP.NET 4.5 and above. With the following inside your Web.config. In both snippets of code you do not need to use the "xdt:Locator" attribute (used only in cases where there are multiples elements of the same name. What you may not see is that in the Web.config we have the "location" tag wrapped around the "system" tag. This is important and something I missed when debugging the problem. So by wrapping my snippet of code with "location" tag this corrects the problem, and started up the bundling and minification in mvc. It is important to note that by default if the debug attribute is not specified it is false and will start up the bundling and minification. The cause of this was actually a issue created by the repository's character notation and not being cleaned up before being checked in (Git uses '*' to note a change). The issue existed for a while but since most browser work around issue nothing appeared out of the order. I normally disable css warnings on chrome because it gets a little annoying but in this case it made me miss the issue (ops). Either way a good catch and now everything is working like it should. Remember to actually check your bundling and minification!